Stud cats are funny creatures. Some grow up to live in the house without spraying and some hose down their run as if it was on fire on a daily basis. It is often hard to guess how your boy might be until he grows up and starts to show you how he will behave as an adult. Some boys need to be kept alone where they can't see or smell other males. Every now and again though there is a little miracle and two entire boys will live happily together. It has happened to me and I consider it magical. Rickie, a blue boy, was two years old and living with a girl to begin with. He hated being alone and would cry while she was out at shows or in the house. Henry was about eight months old. He had been imported from the UK and lived in quarantine with the female who accompanied him from Britain. I have another boy Jackie who is happy to have the other boys live next to him. I had tried him with Rickie when they were younger but Jackie would show he was dominant by “play mating” Rickie. Rickie didn't object and there were no fights but it was clear they were not meant to be pals. When Rickie's lady friend needed to visit with Jackie I worried about leaving him alone. Stud boys can be noisy and in an Australian suburban backyard that can be very unpopular! So we decided to try Henry, our bicolor male, with Rickie. At first we put Henry up to the run Rickie was in and watched for a reaction. All seemed good so my partner, Damien, and I both went into the run. He patted and held Rickie while I did the same with Henry. We let them go up to one another while holding them loosely. The interaction went well so we let them loose but we were prepared to step in and separate them if we needed to. We didn't! Now that Henry is a little older they live in a bigger run with more viewing areas and two wooden kennels. They sleep in one each at night but I have noticed them still squeezing into the same one from time to time. To this day neither has sprayed. Rickie has sprayed before in the house while wearing pants but not while he is happy with his Henry. The benefits of boys sharing are that they have company and can share a run reducing the time it takes to maintain two stud pens, while avoiding the risk of unwanted pregnancy as would be the case if a male had a female companion. Choose Submissive Boys. I think Rickie and Henry know Jackie is top male so don't fight for dominance. Slow Introduction: Introduce the boys to one another slowly and calmly. If you can, put them side by side so they can meet “through the mesh”. That way you can gauge their reaction to each other. Be Prepared To Separate Them If Necessary: Things like raging hormones and girls calling can all change a stud cat's behavior — so be ready to separate them at the first sign of trouble. You must have a back up pen or run that you can use at short notice . Give Them Space: Make sure they have plenty space so they can get far from one another when they want some me-time. You need more room than for a boy on his own. Two Of Everything: You need two of everything . . . two of the comfy beds, two feed bowls, two of the favorite scratching post etc. — just like with kids. The less there is to feel territorial about, the less there is to fight over, the better. So here's hoping that a little bit of stud buddy magic comes your way soon. 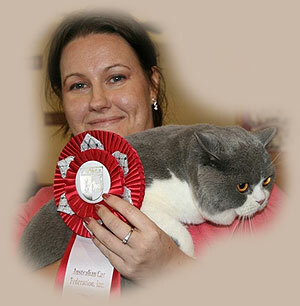 About The Author: Pamela Lanigan is a British Shorthair breeder in Perth, Western Australia. 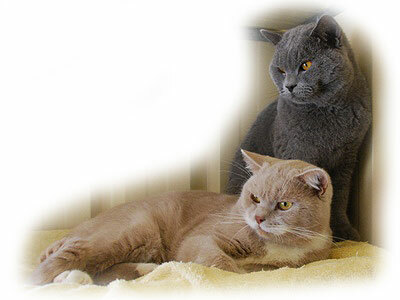 A newcomer to breeding she purchased her first British Shorthair in 2004 and registered her cattery name, Cuddleton soon after. Deciding to specialize in dilute bicolours she looked for a blue bicolour male. She was rewarded with a wonderful blue bicolour kitten called Jackie bred by Marie Orchard in Victoria . ACF Grand Champion & Triple Grand Champion Cyclard Jack Flash has won many Best in Shows locally and several best of breed awards at Australian National shows. His nickname is "Mr Handsome" and has produced some lovely kittens with her blue and lilac girls. Pamela also owns a fawn bicolor, Catbalu Cuddleton, known as "Henry". He is Australia 's first fawn British Shorthair and is known as “Mr Pretty”. He traveled from the UK to Australia in 2007 with a black girl, Catbalu Cinnamon Cinders, Pamela's first non-dilute British Shorthair. Pamela adores her cats and loves to show them. She is an active member of her association COAWA as a committee member and holding the position of secretary. She has served as show manager, show secretary and trophy steward at many local shows and stewards regularly. She hopes the future will bring her a rainbow of bicolor babies.